29 Nov: San Francisco Chronicle. Born in 1961 in Mumbai, D'Souza moved to the United States while in high school… he served as a domestic policy analyst in the Reagan White House. He has since written a dozen books, including "Illiberal Education," and "What's So Great About Christianity," which became a New York Times best-seller … he says, “I'm a Catholic by background. I was raised in Goa…” 717 words. Click here. 1 Dec: Asia Major. Evadne Anderson introduces Cheryl Braganza on the occasion of conferring the "Montreal Woman of the Year 2008" Award. For text click here. For Cheryl's moving response and an insight into her life, click here. For Cheryl’s Art Gallery online click here. 1 Dec: Globe & Mail (Toronto). PARIS DULCIE PINTO. Financial whiz, gourmet chef, adventurer, debater, wife, daughter, sister, aunt, friend. Born March 3, 1953, in Karachi. Died Sept. 4 in Toronto of esophageal cancer, aged 55… Paris arrived in Canada at 18, a feisty young woman with a mission…Paris was born a member of Karachi's tiny Goan Catholic community. The renowned vibrancy of this community was on the wane in post-partition Pakistan… 491 words.Click here. 1 Dec: Mississauga News. More than 100 Mississauga children welcomed Santa to the Sheridan Centre yesterday… Amelia Fernandes was one of the brave children who stood out in the front… the five-year-old in pink sheep-patterned pyjamas and a red nose put on reindeer ears all in the spirit of Christmas. Fernandes' mother said her daughter Amelia loves the holiday season… Click here. 1 Dec: CBC. Jeremy Dias, Jer's Vision founder & executive director, entered the CBC competition, Canada's Next Great Prime Minister, a few short weeks ago, and is now leading, with endorsement from some of Canada's greatest leaders… For details with links to photos, videos and text, click here. For the Jeremy Dias website, click here. 2 Dec: Artist A Day. Born in Kenya of Indian heritage, Brendan Fernandes immigrated to Canada in the 1990s… He has exhibited internationally… Photos and text, 305 words. Click here. 2 Dec: ArtCal. Momenta Art is pleased to present screenings of recent works added to its video library, including work by Brendan Fernandes … Foe presents video footage of the artist receiving lessons from an acting coach to learn the “accents” of his own disparate cultural backgrounds: Goan Indian, Kenyan, and Canadian. The artist struggles, twists his speech, is softly corrected by the coach … Photo and text. Click here. 2 Dec: CBC News (Canada), Exploring different cuisines is a culinary trends that many Canadians have incorporated into their lives in recent years… Sulana and Neville D'Souza run Himalaya Gourmet Sauces out of Cambridge, Ont. "People just love it. Especially that I show them how to use it, give them recipes [and] the fact that it is all natural," she said. Click here. 3 Dec: Moorabbin Glen Eira/Kingston Leader. Bentleigh's newest Justice of the Peace was raised by Jesuit priests in Goa, India. Meet Oscar Lobo who says the priests taught him that integrity and discipline were important… Fluent in Konkani, English, Portuguese, French, Hindi and Arabic, the father of four came to Australia in 2000… Mr Lobo offers JP services at Godfrey Street Community House, 9 Godfrey St, Bentleigh on Fridays from 10am-noon. Details: 9557 9037. 147 words. For an earlier article about Oscar Lobo, click here. UK: Alex dos Santos: TV Programmes on 8 & 9 Dec.
8 Dec: BBC 2. Also online. 20:30. With Anjum Anand 9 Dec: UKTV Food. 19:00. With Cyrus Todiwala. Feijoada featuring his Goa sausage and butterbeans. He also talks to Amanda Lamb about the significance of the paper star decoration used in Goan homes around Christmas. 3 Dec: Curtorim, Goa. ROQUE AGUSTINHO REBELLO (Ex-Uganda, Born on 1924). Husband of Filomena. Father of Shamaine. Brother of late Joe, Isabella Pereira, Sr Annie Francisca (Ribandar Covent) and Rosaline Fernandes. Funeral: 4th Dec at 3.30 pm to Our Lady of Carmel Chapel, Curtorim. 27 Nov: Betalbatim, Goa. ETELVINA MARTIN PINTO E RODRIGUES. Wife of late Inacio. Pascoal Mother of Henry/Scarlet (Canada) and Bonny/Noelha (UK). 27 Nov: Divar-Piedade: BORIS MARIO DO REGO: Victim of Mumbai Terrorist Attack at The Taj Mahal Hotel; Son of Chef Urbano do Rego (Corporate Chef - Taj Group of Hotels)/Idalina, brother of Kevin and Raisa. 26 Nov: Tivim, Goa. ELSA DE SOUZA (Born 1934). Relict of Francis Xavier De Souza. Sister of Rui/Roselind (UK), Peter/Ophelia (UK), Robert (Kenya), Blaise/Marie (UK), Amy (UK) and Cleta/Niel (UK). 23 Nov: Agassaim, Goa. JOAQUIM LINO GONSALVES: Husband of Esmeralda (Berad). Father of Eric and Leslie (UK). The Conceicao family would like to sincerely Thank each of You for your kind expressions of sympathy and support on the recent loss of our beloved Husband and Father, Manuel. We are indebted to you all for your offerings of floral gifts, prayers, Masses and sympathy cards; platters of food, personal assistance and the donations made to the Canadian Cancer Society. Manuel (ex-Nairobi, passed away on October 31, 2008 – Brampton, Ontario, Canada). Your thoughts and efforts are greatly appreciated. Wife Eliza. Children Karen, Neil and Sarah. Who the Bleep cares about clean-shaven, jeans-clad, gun-totting Muslim young men? In a week that was absolute carnage in Mumbai, we are reminded once again how alive and kicking militant Islamist groups are in the global arena. Just as the horror of a 9/11 or 7/7 tends to recede into the background, and the world feels a modicum of security and sanity return to ordinary lives, out come the machine guns, hand grenades and sophisticated bombs. Each attack leaves us all the more unnerved at the wretched inhumanity of young men whose disdain for life is possibly unmatched and unqualified. What’s troubling about this email is that this home-grown group felt it an honour to claim responsibility for this heinous act. Pakistani officials and talking-heads, opportunistically seizing on this sort of sentiment, have been busy on both sides of the Atlantic, UK and US, spin-doctoring the events of last week and talking glibly about how disaffected and marginalised Muslims have become in India and that the Mumbai incident may have its genesis within India itself. Ironically, Pakistan is the last country in the world, India needs to take lessons from in dealing with minorities. Pakistan’s own attitude and record in suppression of minorities is abysmal. But the more pressing question is, what exactly is the point of this sort of militancy? Surely we’ve established by now that there is no causative relationship between poverty and terrorism. These are not poor, disenfranchised men heralding a revolution, trying to even out economic disparity. And for the most part, there isn’t even a clear political agenda. Extremist Islamist groups have succeeded in creating a picture of Muslim victim-hood around the world. There is much talk about the anger on the “Muslim Arab street,” which one assumes is a confluence of the Israel-Palestine problem and America’s continued presence in the Middle East. But if one examines the senseless trail of terror from America, to Britain to Indonesia and India, there is no coherent political ideology here. There is no dialogue sought, or a specific political agenda put forward as wanting redress. This is simply the work of unhinged men; young, corruptible glory seekers wanting their fifteen minutes of fame either here on this planet or presumably in the life after. Personally I think it would be a grave mistake to accord any sort of political mileage to these acts. These men should be filed away alongwith other serial killers and psychopathic mass murderers. 26 Nov. Herald. Those going on holiday to Goa should be aware that taxi service in the State maybe hindered as of Nov, 28. The President of the Federation and Association of Taxi Owners and Drivers, told the press that they have decided to keep more than 3,000 of taxis at home and come on the road to hold the authorities concerned responsible for the making of this strike. 244 words. Click here. 27 Nov. The Guardian. Tour operators to India are currently diverting travellers away from Mumbai and repatriating those caught up in the terrorist attacks last night, which targeted British and American nationals. The two hotels that were attacked - the Taj Mahal Palace and the Oberoi Trident - are popular with tourist and businesses travellers to the city. Holiday-makers who are due to fly in to Mumbai in the next week are being re-routed to other airports in India, and those that have it on their tour itinerary will be offered alternative destinations by tour operators. 653 words. Click here. 28 Nov: Herald. Wednesday night’s terror attacks in Mumbai aggravated Goa’s tourism woes with reports of cancellations from Foreign Independent Travelers coming in… 251 words. Click here. 28 Nov: Times of India. Hardly two months into the tourism season and reports reveal that cancellation of charter flights has touched 20% and the number of charter tourists visiting Goa is down 40%...While 412 charters arrived from England in 2007-2008, this year the number has dropped to 290… 830 words. Click here. 28 Nov: Thaindian. With Goa’s tourism industry already reeling from the economic down-turn and now anticipating a further dip following the terrorist attacks, Chief Minister, Digambar Kamat, has appealed to visitors to stay on in Goa. He assured them that all steps were being taken to ensure their safety. 322 words. Click here. 28 Nov: IANS. Taxi drivers in Goa, fearing competition, threw stones on travel operator-run tourist vehicles carrying domestic and foreign tourists … Nearly a dozen cases of arson and criminal intimidation were reported. Ralph de Souza, president of the Travel and Tourism Association of Goa (TTAG) asked, “Does the government really mean it when they say that Goa is safe for tourists? '… 398 words. Click here. 29 Nov: Times of India. … 12 flights from Russia and three from Ukraine have been cancelled. The British market too is not looking bright as there are very few flight bookings in January and February. The industry fears that there would also be a decline of tourists coming to Goa via Mumbai… any person, flying to Mumbai can cancel their flight booking and get a full refund and the insurance companies too pay them the premium amount…. Click here. 29 Nov: Times of India. Acting tough on errant shackowners along the Baga-Calangute shoreline, the administration on Friday seized 50 deckbeds, 33 beach umbrellas, stools and hoardings that had encroached upon the beach … 273 words. Click here. 30 Nov: Business Line. Already facing the rigours of economic meltdown worldwide, Goan hospitality and travel-tour operators have hit the panic button with cancellations from foreign tourists already trickling down following the Mumbai terror strikes. To add to their woes around 1,000 taxi operators across the State resorted to intimidation to tourists … the image of Goa is taking a beating… 703 words. Click here. 29 Nov: The Telegraph (UK). Travel article. Excerpt: … A friend had suggested Viva Panjim, run by the charming Linda D’Souza on the ground floor of her house. 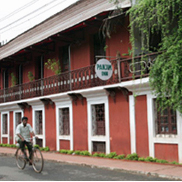 The place also recommended by The Lonely Planet, is perfect for Goan staples like sausage rice, fish curry, xacutti, vindalho and cafreal … Photos and text. Click here. 30 Nov: Times of India. Nadia Menezes e Desai is fed up with the perverted behaviour of male domestic tourists towards women in Goa… They presume that because a woman wears a skirt or dress or shorts she's 'available'… Goa is no longer a safe place where a woman can walk on a beach or road, lit or otherwise, alone. 873 words. Click here. 30 Nov: IANS. Tourists taxis in Goa stayed off the roads for the third consecutive day Sunday after a tiff with private tour operators, affecting a large number of tourists traveling to and within the state… 461 words. Click here. 1 Dec: Herald. 31 agitators held along coastal belt, Churchill fumes. 462 words. Click here. 1 Dec: Metro (London). Goa: Flight time: Nine hours. Currency: £1 = 74.4 rupees. Monarch Holidays has seven nights B&B in the Highland Beach resort, North Goa for £397 per person including flights…Goa is perfect thanks to the number of craft markets …There’s also fantastic jewellery and precious stones such as diamonds and sapphires to be had at about half the price you’d find in Britain. Pashminas are also available by the dozen. On top of that, its hot, there’s a laid-back atmosphere and there’s still cheap availability in the run-up to Christmas. 1 Dec: Javno.hr (Croatia). Tourist arrivals in India are set to fall by up to 15 percent this season after Islamist militants went on a three-day rampage in Mumbai… "After the news about the terrorist attack there was a steep decline in bookings from Russian tourists with many cancellations to Goa," an official of the Association of Russian Tour Operators told Reuters. 415 words. Click here. 2 Dec: Business Standard. …statistics show that Goa hosts 250,000 tourists (domestic and foreign) in December and January, more than half overseas visitors…. inbound traffic going down this year 60 to 70 per cent… hotels are dropping rates to rock bottom levels to attract domestic tourists… 449 words. Click here. 2 Dec: IBN. … Bookings to holiday destinations like Goa are down by over 60 per cent… The immediate short term impact of this terror attack is likely to last for a month but its the long term loss that the industry is worried about top tourist destinations like Agra, Jaipur, Goa and Kerala could also suffer. 222 words. Click here. 2 Dec: Daily News & Analysis. Some international cruise liners scheduled to halt in Mumbai as part of their tour have decided to skip the city following terror attacks targeting foreign tourists…Legend of the Seas, Seabourn Spirit and Oceania’s Nautica, will call at Goa instead of Mumbai… 407 words. Click here. 2 Dec: Navhind Times. The 4-day tourist taxi strike has been called off after a meeting between the taxi drivers, tour operators and the authorities… the Chief Minister said that he would take action against the reps allegedly working on tourist visas… The meeting also conceded the demands of the taxi drivers of having a counter at the hotels on the condition that they would display their rates on the table… 529 words. Click here. 2 Dec: Holiday Truths (UK). Discussion on tourist safety in Goa. Click here. 3 Dec: Times of India. The ripples of the Mumbai terror attack have sent the entertainment business in Goa spiralling downwards… Hotels have cancelled shows because there are no guests… 360 words. Click here. 3 Dec: Business Standard. Indian Railways in conjunction with Cox and Kings will operate a luxury train tour, which will include Goa as one of its stop-over destinations. The train will have 23 coaches with a seating capacity of 100 passengers, out of which 15 will be fully residential coaches with bedded chambers and attached toilets,” said officials. 602 words. Click here. 4 Dec: Daily Mail (UK). Security checks are being carried out in Goa as it prepares for Christmas and New Year celebrations when the area is packed with foreign holidaymakers including thousands of Britons…police are trying to restore confidence by making random checks on hotels and guests houses in the region … 714 words. Click here. 4 Dec: Travel Weekly. Agents have called for more flexibility from tour operators as customers cancel Christmas trips to India and Thailand … tour operators are under no obligation to provide refunds unless the Foreign ­Office warns against all but ­essential travel to India. At the moment, advice is not to avoid visiting the country, but to be extra vigilant…People are unlikely to get refunds ­because, in this market, the tour operators won't be able to resell the holiday. Click here. 27 Nov: Daisy Green. Get your pants out in public and win a once in a lifetime trip to India … Closing date: 11 January 2009. Trip takes place: 10-17 March 2009. Click here. 26 Nov. Times of India. The Convenor of Goan Gaunkary Movement, Savio D’Souza, warned that gaunkars will oppose the RP 2021, tooth and nail, as the government had failed to give them adequate representation in the committee set-up to prepare the plan. More than 70% of land in Goa is owned by the Comunidade. 258 words. Click here. 27 Nov. Zee News. Home Minister Ravi Naik, said on Thursday, that Goa could be on the terrorist radar via its sea route. He further elaborated that police had received certain intelligence imputs. However, he refrained from sharing it with the media as it was classified top secret... 208 words. Click here. 27 Nov. Times of India. The mother of the German Girl admitted that her daughter had broken down after deposing to the Judge and had not been able to confront the matter. She said, her daughter is now “opening up to her.” Meanwhile, the Calangute police have attached the hard disk of the computer used by the minor girl to communicate with the minister’s son, and sent it to Central Forensic Science Laboratory, Hyderabad, for examination. 409 words. Click here. 28 Nov. Times of India. AK47s, SLRs and carbines are out from the armoury and in the hands of commandos patrolling the coastal belt in South Goa, aided by additional staff of Goa Police. DySP Umesh Gaonkar told press, that there were 12 trained commandos in the South and four quick reaction team have been formed to keep vigilance. 238 words. Click here. 28 Nov: Screen India. Goa Chief Minister, Digamber Kamat, told reporters that all peripheral activities, relating to IFFI, stand canceled in the wake of terror attacks in neighbouring Mumbai. Earlier, the State government had made arrangements for various cultural programmes across the State. 162 words. Click here. 29 Nov: Times of India. The Goa police have started massive combing operations since Thursday night in the wake of the Mumbai terror strikes and detained 76 people so far… “Crack down on suspects heavily,” CM Digambar Kamat said… Click here. 29 Nov: UNI. Tennis ace Leander Paes today stressed on the upgradation of the tennis infrastructure in Goa in the next five years to train the budding players for future. Paes has been nominated as the president of the Goa Lawn Tennis Association 177 words. Click here. 30 Nov: Times of India. A court on Saturday awarded capital punishment to 11 people and life sentence to 12 others in connection with the 2000 serial blasts in churches across Andhra Pradesh, Maharashtra, Karnataka and Goa. 655 words. Click here. 30 Nov: Zee News. Goa Congress retained its Pale constituency seat by defeating closest rival BJP. Congress candidate Pratap Gawas got 7,867 votes defeating BJP candidate Suresh Amonkar who got 6,333 votes. The 40-seat Goa legislative Assembly now has 18 Congress legislators, 14 BJP, three NCP, one independent and one MGP and a United Goans Democratic Party (unattached) legislators… 157 words. Click here. 30 Nov: Herald. “Give us our daily bread”, was the common plea one heard from tourist taxi owners and drivers from Salcete’s coastal belt as they felt let down by politicians to protect their livelihood being invaded by tour operators and Russian Reps… 401 words. Click here. 30 Nov: Herald. Day two of the ongoing agitation by the Tourist taxi owners and drivers saw the tourist taxi owners and the tour operators engaged in a fierce tussle along Salcete’s coastal belt on Saturday. 234 words. Click here. 1 Dec: Economic Times. Like Scotch whisky from Scotland, champagne from France and Tequila from Mexico, Feni will soon become India’s own drink from Goa. If everything goes well, it will not be long before Feni is assigned a Geographical Indication (GI) Certificate. The implication of a GIC for Feni is simple: Only Goa can make Feni. 418 words. Click here. 1 Dec: Just Dial. Some sections: Book Shops; Car Hire; Computer Training Institutes; Courier Services; Estate Agents; Florists; Hotels; Internet Service Providers; Restaurants; Taxi Services …Click here. 2 Dec: Times of India. … In the last year more than four women apply for either divorce or separation as their partners had hidden their HIV status at the time of marriage. Women’s liberation has touched a new high in Goa, with few women daring to put the lid on the unhappy marriages…Most of the women are from Goan middle class families, who are in their early twenties… 470 words. Click here. 2 Dec: Herald. To many, half of Goa’s woes are thanks to the ‘outsiders’ and ‘migrants’ who are flooding into the state. I have never been able to find it in my heart to despise these desperate people trying to survive any which way they can. I even take issue with those who label them ‘outsiders’. 792 words. Click here. 2 Dec: IANS. As many as 243 migrants illegally staying at a South Goa slum were arrested as part of measures undertaken by authorities to keep Goa terror free during the tourist season. The state has also taken steps to tighten security along its coastline, police said Tuesday. 338 words. Click here. 2 Dec: Times of India. Several police vehicles were spotted on the coastal belt late Monday evening, engaged in surprise checks at luxury hotels. The name and nationalities of guests are of prime concern to the police. Also under the scanner are how the bookings were made, the kind of vehicles the guests have been using as well as the length of stay. 201 words. Click here. Security in Goa an Eyewash! 3 Dec: Herald. Herald decided to take a look at the arrangements made by the State at the border check posts … no checks of any vehicles … Anybody can gain entry into the State by just paying Rs 10 … average collection is Rs 25,000 to Rs 30,000 daily … 593 words. Click here. 3 Dec: Herald. Pernem police station Inspector Nelson Albuquerque was placed under immediate suspension after the Inspector General of Police (IGP) Kishan Kumar conducted a surprise check at the border post and caught the police personnel collecting money from incoming vehicles… 312 words. Click here. 3 Dec: Herald. Stating that the government wants to develop the State as an international entertainment hub, Chief Minister Digambar Kamat unveiled plans for setting up a world-class film city, film college and shooting studio besides a state-of-the-art multiplex at Ravindra Bhavan, Margao. 363 words. Click here. 3 Dec: IANS. Faith overrode terror, fear and insecurity as thousands of Goans, Maharashtrians and Kannadigas thronged Goa over the last nine days to offer prayers on occasion of the feast of St. Francis Xavier. The event culminated Wednesday… 407 words. Click here. 27 Nov: International Herald Tribune. Visitors headed to Toronto may find Canada's largest city refreshingly hip, diverse, utterly cosmopolitan - and affordable. Here are some tips to help you explore the city… 1205 words. Click here. 2 Dec: Spotlight Toronto. Chef Debu Saha writes: I have designed a four course Goan Non-Veg Tasting Menu and a Goan Veg Tasting Menu which I’m sure you will enjoy…1st Goan Food Festival to be held at 552 Mount Pleasant Road, from Thurs Nov 27th to Sun Dec 7… Click here. For the restaurant website click here. 2 Dec: The Australian. Three former members of the Exclusive Brethren have asked a judge to order the arrest of the sect's leader Bruce Hales for genocide and people smuggling… Indian sisters Lydia and Rebecca Desai [of New Zealand] and Priscilla D'Souza say they also fear for their safety. 467 words. Click here. 4 Dec: Associated Press. …The beaches of Goa, India, are so immersed with Israeli backpackers that restaurants offer Hebrew-language menus and some locals are familiar with Hebrew slang and jargon. But with the recent unrest in India, the number of places safe for Israelis is rapidly shrinking… Click here. 26 Nov. Herald. Many Goa-bound train passengers were caught in the indiscriminate firing at the Chhatrapathi Shivaji Terminus late Wednesday evening. The passengers had just begun to arrive at the terminus to board the Konkan Kanya which was scheduled to leave the station at 11pm. Being strangers to the Metropolitan city and not knowing where to go, many fled to the outskirts of Mumbai city, such as Thane and Vasai. 197 words. Click here. 28 Nov: Parramatta Sun. Crystal Dias grew up near and once worked at the Taj Mahal Hotel in Mumbai before coming to Australia. Mrs Dias, currently Parramatta Council's communications officer, said she was saddened by this week's terrorist attacks… Photo and text, 333 words. Click here. 28 Nov: Times of India. Urbano do Rego heard the desperate dying words of his 23-year-old son early on Thursday morning…Boris do Rego, a junior sous chef at the Taj, Mumbai had been shot dead by terrorists that morning…Along with Boris, four other chefs were shot dead… 438 words Click here. Mumbai: Narrow escape for Goans! 29 Nov: Herald. “It was sheer luck that I missed getting the gunshots of the terrorists who attacked Taj Mahal,” was how Bertie Gomes, native of Orlim-Salcete, said… Elvis Silveira from Sant Estevam had a miraculous escape… John Alex Fernandes from Aldona was on duty in the Middle-Eastern restaurant on the top floor. There were many other Goans working in the Taj when the terrorists attacked the hotel. These included Jose Ferrao (San Estevam), Selvin Fernandes (Calangute), Ubaldino Gomes, Vincent Fernandes, Anselm Fernandes. 842 words. Click here. 29 Nov: The Independent (UK). Jerome Taylor talks to Sebastian D'Souza, a picture editor at the Mumbai Mirror, whose picture went around the world … what angered Mr D'Souza almost as much were the masses of armed police hiding in the area who simply refused to shoot back… 545 words. Click here. For some of Sebastian D’Souza’s photos of Mumbai & Goa, Click here. 1 Dec: Sky News. 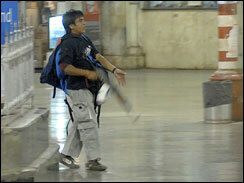 Sky’s Alex Crawford talks to a photographer who filmed the attack on Mumbai's railway station as it unfolded. For the video clip, 4m. 32s. click here. 28 Nov: MeriNews. A 50 per cent drop is expected in tourist groups coming to India between January and March, 2009. The travel industry has already suffered after the bad press Goa got after the Scarlett Keeling murder and the serial bombings in Delhi… 544 words. Click here. 29 Nov: Asia News. Firm condemnation from Pakistani Christians for the attacks in Mumbai. In expressing "profound solidarity and condolences" to the victims, they call upon the governments of India and Pakistan for "a joint effort" to ensure peace and security in the region… 558 words. Click here. 30 Nov. Times of India. It was as if nature itself felt the grief flood the island of Divar as it bid farewell to its fallen son, Boris do Rego, who died in the terrorist attack on the Taj Hotel, Mumbai. The sky lay overcast and thunder threatened as thousands accompanied the funeral cortege to its final resting place. 236 words. Click here. 30 Nov: The Sunday Times (UK). The sole Bombay gunman captured alive has told police he was trained in Pakistan and ordered to "kill until the last breath", according to a leaked account of his interrogation. 768 words. Click here. 30 Nov: Economic Times. For Indians overseas, it's a double whammy. Besides coping with the trauma in the aftermath of the worst terror attack that India has ever faced, they also have to try to put up a brave front as the international community finds its confidence shaken in Brand India… British MP of Indian origin Keith Vaz, for instance, has lost no time in publicly rooting for India in a big way and even downplaying the official travel advisories to an extent… 533 words. Click here. 1 Dec: Daily Mail. Princess Eugenie, 18, the Queen's granddaughter was said to be 'very shaken up' at the thought of what might have happened had she prolonged her stay at the Taj Mahal Palace Hotel… She had flown to Goa when terrorists launched their strikes. and called her mum to let her know she was fine… She is travelling with a school friend and her Scotland Yard bodyguard… 394 words. Click here. 1 Dec: Sky News. Edna Fernandes examines the political implications of the Mumbai massacre. She writes, “Much is at stake. India's reputation as a safe destination for foreigners, Hindu-Muslim relations within a country periodically plagued by bloody religious riots, and a new freeze in relations between the nuclear armed rivals.” ...617 words. Click here. 2 Dec: Daily Telegraph (Australia). He is a street kid who says he has little to live for, but Martin D'Costa may just have a nation in his debt. The 26 -year-old Indian's quick thinking is responsible for saving three Australian lives early in the Mumbai shoot-out as terrorists fired indiscriminately in the streets… 501 words. Click here. The Konkani stage in Goa may be predominantly a Catholic Goan feature. However, Goan Hindus have contributed to it in no small measure. Recently, Pradeep A Naik was featured on Goanet for his considerable output on the Konkani stage. In an article by J P Pereira, titled 'Pradeep A Naik, a Multifaceted Personality' we learn much about this "dramatist, writer, film actor, radio artiste" and many other things. "Pradeep has acted in the English feature film Tripping on a Bicycle, Konkani films--Daulet, Ek Jivo Bhorvanso, Just a Minute, and in Marathi and Hindi films." Robin Viegas is intrigued "that in 2004. Karnataka's former Chief Minister H D Kumara Swamy was worth Rs 3 crores and four years later, Rs 39 crores." Robin then draws our attention to the following site: http://www.empoweringindia.org "that at the click of the mouse offers information on 45000+ politicians from every state and constituency in the country [India]." Finally, in the light of the recent terrorist attack on Mumbai, do read an interesting polemic by Martha Nussbaum, a professor of law and ethics at the University of Chicago. Her article is titled 'A Cloud over India's Muslims' and can be read by clicking here.